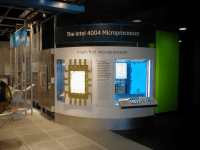 A group of engineers have taken the effort to recreate the 4004 as an anniversary project to build a larger than life model displayed in Intel’s museum in the Robert Noyce building in Santa Clara. They have had to recreate the original schematics as they have long since been filed away and lost. 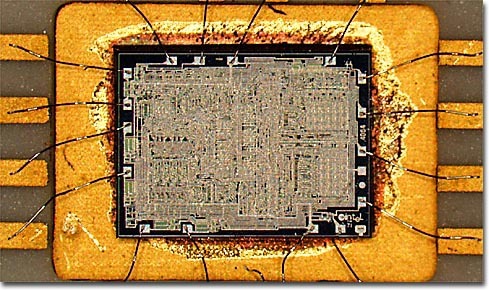 As the 4004 was the world’s first microprocessor, take a look as it’s a great project. God, doesn’t time just fly? It seems that I’ve saying that I’ve “been in technology” for 25 years for simply ages. Wrong. It looks like 35 years is now nearer the mark! I want this blog to look forward rather than backward, but my readers will have take a little of my nostalgia pie I’m afraid! 35 years ago, back in those early years of the 1970s, I was one of the lucky recipients of the world’s first ever microprocessor, the MCS-4004. As has proved to be the case of other technology revolution I’ve had the luck to be participate in since, I had absolutely no idea at the time of the future impact of these beasts. I worked in ICL’s Advanced Research Laboratory at the time and I believe I received the first 4004 in the UK – as I did with the later 8008 and 8080. Where did I actually get them from? Well a little start-up called Intel had opened a UK office just outside of Oxford and was staffed by only two sales guys – I probably still have their business cards somewhere in the attic if I could be bothered to delve deep enough. What seems so funny to me today, was that it took me several months to remember this funny term microprocessor and I was very confused about how to pronounce the word You see, I used the UK pronunciation while these two sales guys used the American way. I had no idea which was correct. Indeed this confusion still reigns today and is not limited to just the word microprocessor. Having this little DIL (dual in package) just locked away in my desk drawer was not really on as I was expected to do something with it. So I went up to the floor above mine and asked a number of ICL New Range mainframe architects for suggestions. None were forthcoming and, bar one of them, they were all quite dismissive. We had absolutely no idea what we could use this tiny processor for. In the end, I built a little demonstrator that toggled a port connected to those new fangled things called LEDs. So much for revolutionising the world electronics industry! A while later I received an early example of the 4040 and 8008, the 8-bit follow on to the 4004. 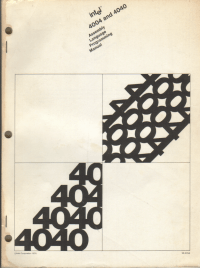 I still have the programming manuals for the 4040 and the 8008 and they are quite amazing to read in the light of the powerful multi-core microprocessors we have today. I eventually came up with an idea on how to use the 8008. I was busy building a test machine for Intel’s first 1k bit dynamic memory, the 1103 and I needed to programme it from the standard computer input media of the time – a paper tape reader. So that is what I designed, an 8008 powered paper tape reader. Wow! 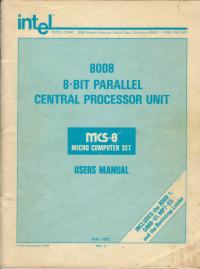 We first needed an assembler programme to convert the 8008 assembly language instructions into binary, so we wrote one in Cobol to run on an ICL 1900 mainframe computer. I actually found the listing of the PTR programme the other day printed out on typical mainframe hammer printer paper of the time. From what I remember, as there were no 8-bit wide programmable ROMs at the tim,I had to put the programme into two 4-bit 256 word types. Those old computer rooms were just marvellous to behold. Lots of deafening line printers chugging away together with all those high speed paper tape readers spewing 8” rolls of tape through high into the air. Now if, they ever went wrong… Using a PC as I am now, is nowhere near as much fun as is far less impressive. Anyway, that paper tape reader really worked well and ICL did eventually take microprocessors more seriously, though it was a few decades later I suspect. This entry was posted on Friday, January 12th, 2007 at 11:27 am and is filed under All, History, Semiconductor. You can follow any responses to this entry through the RSS 2.0 feed. You can leave a response, or trackback from your own site.